The hottest phone of the summer might just be OnePlus’ latest flagship, the aptly named OnePlus 6. It deserves the top spot on that list for a number of reasons: it offers a lot of features for the price (including advanced slo-mo and 4K/60 video capture), and boasts the most eye-catching design the company has ever released. Even ahead of its launch, the OnePlus 6 seemed to gain the reputation of being the “phone to beat” at its respective price-point. Part of that no doubt has to do with the fact that the company behind the device has been largely knocking it out of the park for a number of years now. That’s thanks to OnePlus’ laser focus on delivering feature-packed phones that cost hundreds less than other flagships on the market. The device designs haven’t hurt adoption, either. For being a company younger than five years, OnePlus has made a huge impression on the Android market. I even have a few friends who are devout iPhone users who happily admit that if they made the trek on over to the Android side, it’d be OnePlus on their radar. That says something. Having used the OnePlus 6 for the past month, I can say that the company has yet again delivered a quality iteration, and there’s nothing about the latest device that I’d desperately change – though there are still some things to talk about later. If you’re rocking a OnePlus 5 or 5T, I would not encourage an upgrade to the OP6 unless you simply want the latest device whenever one comes out. If you have a OnePlus 3T or any device two or more generations old, moving up to a OnePlus 6 will feel like a significant upgrade. The OnePlus 6 features pretty standard fare spec boosts over the 5T, with the Snapdragon SoC upgraded to 845, and likewise, the graphics upgraded from Adreno 540 to 630. The resolution has seen a slight boost to the height, to accompany the notch addition. Support is also present for the latest Bluetooth standard, and wireless is powered by 2×2 MIMO dual-band 802.11ac wireless. Dual-SIM doesn’t matter to everyone, but it’s a feature I’ve really come to appreciate with OnePlus’ phones; since I regularly use both a Canadian and US SIM, it’s super convenient to have both sitting in the phone at all times. The only thing better would be a dual-SIM slot that could also accompany a microSD card. 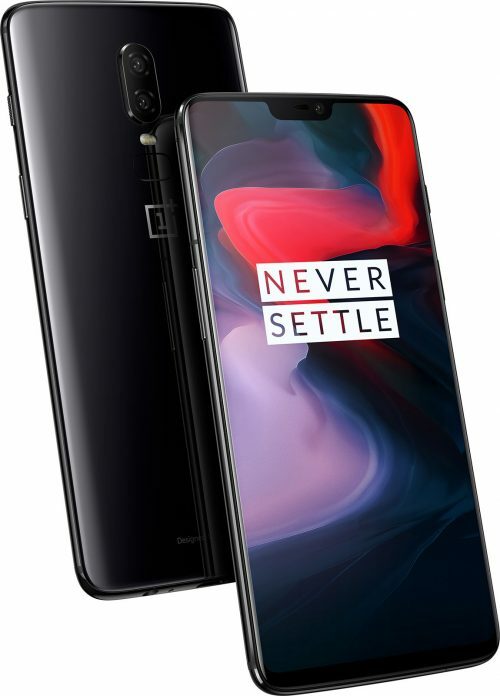 OnePlus 6 "Designed by OnePlus"
Other important specs include a dual rear camera capable of capturing up to 4K/60, and slow-motion up to 480 FPS (at 720p). The battery-size remains the same from the 5T, at 3300mAh, and out-of-the-box, Android 8.1 will be preinstalled. Since I received the device, I’ve received three iterative software updates, each adding just a bit more polish to the OS. The least-expensive version ($529) of the OnePlus 6 ships with 64GB of storage, and 6GB of memory, while the bigger SKUs increase storage to 128GB or 256GB, and memory to 8GB. All come with the notch, though – don’t worry about that. In some of the shots above, you can see how the OnePlus 6 looks in comparison to its predecessor, the OnePlus 5T. Even when powered-off, the OP6’s notch can easily be seen. I’m partial to the design of the 5T, but the notch on the 6 doesn’t annoy me as much as I thought it would, and I’m betting most would find themselves thinking similarly after some use. After a while, you just don’t notice it, like how gamers who use a 3×1 monitor configuration can block out the bezels after a while. I love the aesthetic of glass phones, and even the feel, but they often come with the downside of a less satisfying finger print reader. I don’t think the OP6 is much of an exception, but the reader is at least outlined with a bump to make it pretty easy to find. If you use a case, it will be incredibly easy to find, since those are designed around it. Ultimately, I prefer the finger print reader on the 5T, but the OP6’s reader, despite how glossy it feels, hasn’t failed me. That said, I’m starting to wonder if the reader’s lack of texture is the reason OnePlus decided to remove a gesture which allowed you to scroll the notifications menu down with a quick swipe of the reader. This is a simple feature, but it’s one I found myself using religiously. I should stress that like the notch, the lack of a finger print gesture is hardly a deal-breaker. But at the same time, I love it when companies manage to eke extra functionality out of hardware we already have, and I thought that simple gesture was a cool addition. Fortunately, you can still use the reader to snap a photo – very helpful for selfies. And speaking about software-related things, the solution on the OnePlus 6 is close to stock Android, with a few additions from OnePlus. The main differences from stock Android are that OnePlus adds its ‘Shelf’ feature, which lets users quickly view recent contacts and apps, storage and battery info, and also a built-in membership card wallet. The OnePlus Community app is also preinstalled, allowing you to quickly see what the community is up to, including keeping up on updates coming to OnePlus’ phones. Lastly, a simple, but useful ‘Notes’ app is also preinstalled. OnePlus 6 'Shot on OnePlus' gallery. It’s not an important thing to point out, but I do like OnePlus’ attention to the community, especially through its #ShotOnOnePlus movement, which sees users take quality photos with their OnePlus that everyone else can use as a home or lock screen wallpaper. It’s a good way to promote the device’s camera capabilities, and get users out there showing off what’s possible. OnePlus hasn’t exactly been the quickest when it’s come to rolling out OS updates, but the company does host an in-depth downloads page that lets you downgrade or upgrade your ROM with relative ease (a guide is included) to any version ever released. Usually this page will be used in case you use another ROM and need to revert to factory settings, a process I’ve done in the past, and have had good experiences with. What does confuse me today is how one would upgrade to the Android P preview. Prior to the OnePlus 6’s launch, OnePlus touted support for Android P right out-of-the-gate, but since then, not much has been said, and no download is available on the aforementioned downloads page. Nonetheless, with the company’s advanced attention on the next major version of Android, we can hope that means users won’t have to wait too long after its launch to see it hit the OnePlus 6 (and others).